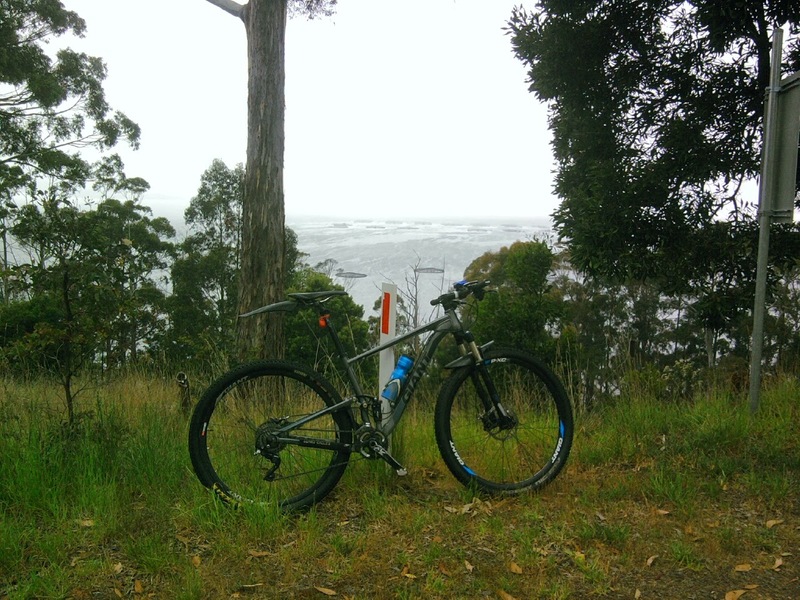 Well if you had asked me a bit over a year ago to ride across Tasmania I would have said you were crazy. This adventure will be one that I will always remember and in a good way. 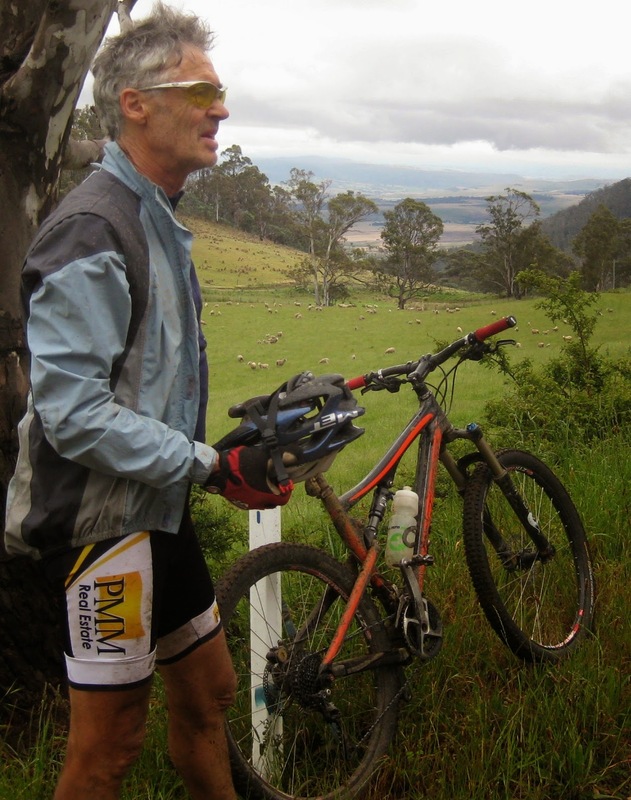 I have met some great people in our ride group and have really enjoyed their company, it was all well run and easy going considering it was not a commercial tour, just a group of people that enjoy riding and experiencing what Tasmania has to offer. The group comprised of our support team of Barry and Cheryl who were always there at the end of the ride with food and drinks and supplies that they picked up on their way for us. They have to navigate the back roads of Tasmania to find the meeting points and sit and wait (sometimes quite a while) until we arrived tired and weary, it was much appreciated. Our ride group comprised of our only female rider in Jo Oliver who would often be up front on the technical climbs and was impressed when listening to her story's of huge alpine and mountain conquering road rides. Then there was Leo Kaimatsoglu, Cheryl's husband. To see this man ride the way he did considering only 18 odd months earlier he had a biking accident that broke the top off his femur really amazes me. Then there is Ross McPherson (Barry's son) our mechanic, sprinter and time trial king. Our hill climber Michael Richmon leaving us all behing on the big climbs. Steve Watson one of our guests from the nations capital but we didn't hold that against him and some respect needed for riding a fully rigid bike over some of the tracks was well earned. Des Brown the other Canberran that snuck across Bass Strait with Steve, would amaze me time after time. A solid sprint would take place on the sealed road and after a few km Des would still be there, a big climb would present itself and Des would be right behind you if not passing and after heading down the nastiest, rocky, rutted and muddy hill descent and reaching the bottom you turn around Des would be there. I will be in good stead if I reach his age and still have that level of fitness. Nigel Hume our official 2IC and resident fireman, always there to take the blame for any dodgy track selection and great for a chat on the run and over a drink afterwards. And the man that made it all happen Dale Carney, the bloke that isn't even all that interested in mountain biking dragged his old Giant that had been left untouched since the last attempt at the trail ten years previous. Without Dale this adventure would not have come together. 434km ridden and over 9,300 meters of elevation climbed in six days it was a great experience an wouldn't have thought I could have achieved seeing that that my longest ride before that was 50km. Dales 10+ year old Giant Ringcon 26er (which will most likely be retired) Only done two rides! Where I should have arrived into Dove. Maybe next time. After packing our gear we all met up at the New Norfolk caravan park, at the usual 8am start, Dale gave the briefing on what lay ahead. Steve on the big Kona 29er had headed off a few hours before us so we would be following his tracks. We all saddled up and headed out of town, we would not see Cheryl and Barry again until we reached Judbury at lunch time for well needed food. Dale lead us out of town via Lachlan Road on through the small town of Lachlan and then turned onto Hydehurst Road a short way and onto Jefferies Track and the real climbing began. The Jefferies track starts out as a decent grade climb on smooth gravel up and out of the last signs of civilization. As the track progressed the small detours on the side of the track where four wheel drives intentionally bog themselves became the whole track with huge holes deep enough to swallow a bus. On no circumstances would you ride through any puddle on this part of the track as you could quite likely be swimming. The track came to a sharp climb so steep at one point to where no one in the group could climb the slippery and rocky track so pushing was the only option. Fortunately it was only a short pinch and we were back to dodging our way around the bog holes before turning onto White Timber Trail where the track improved and the whole area around us was timber plantation. The track went on and on with big long descents and a few climbs but we were getting lower and lower but the track kept turning North West, not the direction of Judbury. We hadn't seen Steve's tire tracks for a while no red and yellow Tasmania Trail triangles which was a bit concerning. We reached a four way intersection at a bridge over a creek and though about what to do. There was no phone reception and it was two hours past the time we were supposed to arrive at Judbury. We were lost! Well not really lost we knew where we came from, it just was a long way back with the thought that we once were at 700+ meters and now down around 200 meters, so a soul robbing climb would be needed and even then where did we go wrong? After a short climb up one track to see if the was any phone reception and if we could see any land marks, we were disappointed on both counts, no phone and tree plantation as far as the eye could see in all directions. We had no other choice, we did not know where any of the other tracks went so it was back from where we came....up that long climbing track. We met two guys coming the other way in Fieldwicks vehicles, they had been working breaking rocks in a quarry we had passed hours before. They said that the track we had been following headed back to New Norfolk, so we were riding in a big circle. We continued on and as we got higher Ross managed to get some phone reception and called Barry and Cheryl to let them know we were ok and were on our way back to find the right trail. Des, not long later was able to call Steve who had now gone through Judbury and was on the second leg. He gave us directions to where the turn off was and even with his GPS found it hard to find having gone down one dead end and having to back track. After a slow ride back up checking every side track we found Steve's dead end track an then further back the real trail that would have been on our left when we first came through. It was obscured by two big piles of blue metal and off part of the main track with the large chunky blue metal surface. There were three arrow markers pointing it out but the trail map did not show a sharp left turn and it was on a good descent so a speed, we all had missed it. All were relieved that the right trail was found but disappointed knowing that there now was not enough time to complete the last leg from Judbury to Dover as we had blown four hours with the detour. We headed down the trail which has a steep rocky slope down onto a smoother trail which improved the further we descended and was fairly easy to navigate down to civilization and the little town of Judbury with Cheryl and Barry waiting with out now very late lunch, but it still went down a treat. My wife Selina and my two children Dane and Shae were heading down to meet me in Dover that afternoon so I gave them a call a they had only just passed the Judbury turn off so they were able to swing by and pick me up. It was really good to seem them again after a long week away. The second "rest" day started a bit damp looking with some rain over night and a grey sky as we prepared for the days ride. After breakfast at the Lachlan Hotel for some of us (which all of us were charged for, not happy) we set off up the Lyell Highway a short distance before turning left down the gravel Lake Repulse Road. After winding our way through some farming country we were passed by a farmer in a ute who pulled over and introduced himself as not only the owner of the land we were riding through but also the president of the Tasmanian Trail Association after a bit of a chat we headed on our way and started a descent past some cattle who seemed intent or running down the road instead if off to the side, eventually after giving them some space they got the hint and we had reached the bridge over the Derwent River right behind the Repulse Power Station Dam holding back the waters of Lake Repulse. A bit of a climb up and now into sparsely forested land due to a fire a few years back and the track became a bit muddy and it was sticky clay that stuck to your wheels so they would hardly turn, this was fixed with another descent which threw the mud in large chunks everywhere before arriving at a creek to wash the remaining off and get our feet wet. The rocks were large an slippery so care was needed and the choice was shoes on or shoes off, I chose off which kept my shoes dry for about half an hour more. We continued on finding the trail markers quite well meandering through previously burnt bush and pine plantations, the native bush was slowly recovering but the Radiata Pine plantations were now just burnt and blackened sticks. After a way we turned right onto Ellendale Road and though the tiny township of surprisingly, Ellendale where we stopped for a quick refuel before continuing on, and a few km out of town half way down a nice descent the Tasmanian Trail left the main road and into some private land. We lifted our bikes over a gate and the follow the trail though a very enjoyable bushland track down a few hills and up a few steep pinches (which I think from memory only Michael and Jo managed), a great little section before coming out to a gate and an open field which once crossed and through another gate it returned to bush again. We then came back out into open fields again so had to be on alert to find the little Tassie Trail triangles. We nearly headed down an obvious track before Dale pulled us up as the trail actually followed down the fence line (Good catch Dale). This brought us to the top of an amazing grassy descent which a farmer we met at the top had only just mowed. 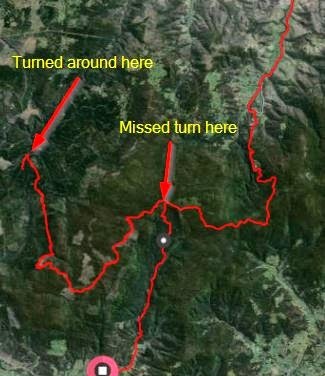 It was fast, wide, great fun and brought us down to a farm house at Meadow Bank where we turned right and up a gravel climb of Meadow Bank Road and then down a fast descent over Ginger Creek and met up with Gordon River Road at the crossing of the old rail crossing. We then headed down the road at Fenton Forrest past some houses and farmland up a climb to a gate where another farmer met us and offered to open the gate and after crossing his crop opened another, great bloke! We continued along the ridgeline over looking Glenora before a right turn to head down hill into the town onto Kenmore Road and out to join Gordon River Road near the town swimming pool. We then followed Gordon River Road through to Bushy Park for some much needed food and drink, then after moving off we crossed the river Derwent again and not long after met the Lyell Highway and straight across onto the gravel Black Hills Road which after our lunch break seemed so slow and dragging as we pedalled down to the base of a very large hill with our days destination on the other side. It was a long slow climb but the weather was in our favour with the overcast conditions keeping us from getting too hot. after a 300 meter climb we reached the top and a reward of a few snake lollies before heading down the huge decent into New Norfolk, first on gravel then onto tarmac I almost reached near 70kph down into town. We then parted ways to our different accommodations to get cleaned up then meet up at the pub later for dinner. This is where Nigel was leaving us due to work and family commitments. Thanks for the company Nigel your not bad on a MTB for a roadie ;) . After dinner I made my way back to the caravan park by the river and my little cabin for the night to rest for the big day tomorrow. We had ridden just over 75km and climbed just more than 1,800 meters, not bad for a rest day! Travel theme. Theme images by jallfree. Powered by Blogger.